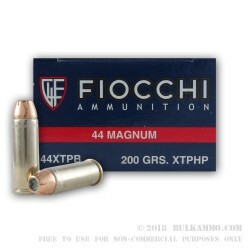 A very good price point for a premium 44 Mag hollow point offering by Fiocchi that utilizes a Hornady XTP projectile – one of the most proven projectiles available contemporaneously. This is a fantastic price and a fantastic round for any .44 shooter who needs a performance round for their big .44’s. 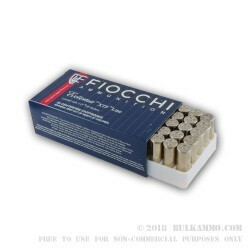 Fiocchi, a pioneer in offering lower priced ammunition to the broad American marketplace by leveraging their lower production costs that have been whittled down to a very lean organization over the last 100+ years. Hornady, a company known for their innovative and proven technology and engineering in projectile design and having some of the tightest production quality control protocols in the industry. 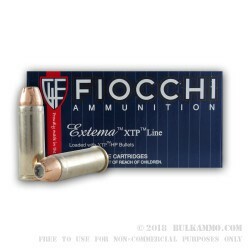 This is a match made in heaven for those who want to reap the benefits of Fiocchi’s responsible corporate culture and well run organization, while getting Hornady quality projectiles in a clean shooting, high performance round. This round offers 1490 feet per second velocity out of the barrel and an astounding 986 pound feet of energy at the bore as well as a nickel plated brass case that is also easily reloadable thanks to the Boxer primer. This round is almost too good to be true for .44 shooters on a budget.